To follow a melodic path between Heavy Metal, Hard Rock and Glam Metal is not an easy task, as many can think. No, because the three styles are really eroded, and many bands lost their efforts doing nasty album, thinking that they are “bands from the 80s” (although none of the members were born on that decade, have this in mind). But there are some bands that are really amazing, creating their own path, even not creating something new. 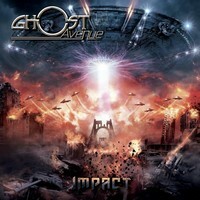 This is the case of the Norwegian quintet GHOST AVENUE (that was known as GHOST some time ago), as we can hear on their second album, “Impact”. Their music is the style described above, with the strong weight and technical parts from traditional Heavy Metal (only with a modern insight), the catchy melodies from Hard Rock and some of the musical accessibility of Glam Metal. Definitively, it’s nothing really new, but the way they play and compose their songs is really different from what was done before. And it turns their work really good! The sound quality of “Impact” is amazing. The aggressive and heavy weight that we can expect is here, and the level of sound clarity is really very high, so we can feel the melodies and understand their harmonic structures without complaints. All sounds really great. The embracing melodies and aggressive guitar parts of “Impact”, the excellent work done on bass guitar and drums on the heavy and strong “Escape” (with a very good and melodic chorus), the touching heavy melodies of “Time Traveller” and “Affection” (this one with a clear musical accessibility touch), the heavy and emotive “Construction” (where the Hard Rock side is stronger, showing excellent vocal parts), and the heavy and aggressive “Collateral Damage” can be said as their finest moments. But keep in mind: the entire album is really good. They are mature, musically speaking, so give them a chance to satisfy your musical needs and desires.